It smells great – it’s a light, refreshing, clean scent (in my opinion). You know you’re putting Hoo Ha on and it protects you as such – thick and smooth. I make sure to put it on my chamois pad in my bike shorts. 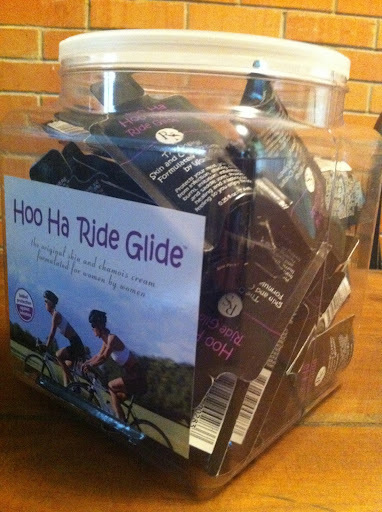 Hoo Ha has been working miracles for my long, boring rides on the trainer. I’ve not had any issues at all with my girlie parts thanks to THE HOO HA! The one thing that in talking with my co-advisor and one of our male MSState Tri Team members about Hoo Ha was that GIRLS LOVE THE TINGLES! Well, this miracle cream tingles. Some guys like it too – Dustin tried it and he does not like the tingles – this is a PLUS for me because I KNOW THAT HE WON’T ACTUALLY STEAL IT like he tended to do with other products on the market! lol. There are many guys who like to use HHRG to protect their twig & berries… just sayin’ (they may not admit it publicly but they do like it and use it just like us ladies!!) And if you’re a runner, this will be great for you too! Can you say no more inner thigh friction!?!? It’s a little pricier at around 20 bucks but in my opinion, seriously worth the MONEY! 7.) Tweet, Blog, and/or Facebook this Giveaway. 8.) Donate to my fundraising page for the 26.2 with Donna – 70% of ALL Donations and entries go to Breast Cancer Research & 30% goes to The Donna Foundation helping those with breast cancer with their patient care… this is important to me as you will read on my fundraising page… help the ta-ta’s this month! For every dollar, it will be an entry – just make sure you post that you donated in the comments section on here – it’s that simple. And if you tweet and/or facebook about my fundraising efforts, that will be an additional entry a piece. There’s a lot of ways to get yourself a chance at some Hoo Ha!! Tell your friends about this giveaway! And remember, I’ve packed extra Hoo Ha OTG’s for Kona so if you see me on RACE DAY, I may just have a little something for you (look for the yellow shirts with BERNATOVICH on the back)!! found your blog through a Reflect Sports FB post :)New follower-and it public too!! lolthanks for hosting a great giveaway and "paying it forward" I am a lover of HHRG and it is worth every cent!! put in a guess on Mike's blog-thanks for the link, it looks like it'll be interesting to follow along!